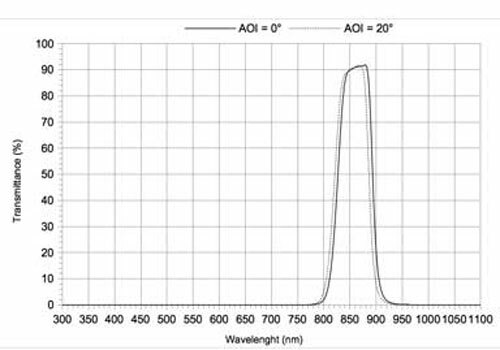 General purpose optical IR bandpass filter at centre wavelength of 860nm. It is deposited on thin glass carrier. The filter is designed as a single peak window filter for the wavelength range of 300 – 1050nm. It is well adapted for applications with high power LED of 850nm (e.g. OSRAM SFH 4059).